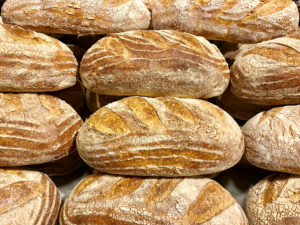 The Growing Market for Artisan Bread | Naegele Inc. If we were to sum up current consumer sentiment about food into one sentence, it would be this: People want real, healthy food. That means food made with ingredients they recognize and using processing techniques similar to what they would do at home. This trend is especially apparent in the bread aisle. While fresh bread sales in general have declined in recent years, the artisan bread category is growing by about 2-3% per year. This “craft carbs” trend is similar to the craft beer boom that drove even the world’s largest beverage company to revamp its portfolio. Let’s look at three of the ways a growing desire for healthier, more natural food is fueling the market for artisan bread. Just about every recent consumer survey shows that people are trying to eat healthier. Different people take different approaches, but many consumers equate healthy products with clean labels. They want foods free from saturated fats, added sugars, and chemical-sounding additives and preservatives. Artisan bread fits the bill because it’s made using only the most basic ingredients and doesn’t contain any undesirable additives. Consumers are also demanding more authentic foods, which is driving interest in traditional ingredients like ancient grains. A 2015 survey found that more than half of U.S. consumers believe that ancient grains are beneficial to their health. Bakers have been quick to respond to this growing demand. Innova Market Insights found that during the 12 months ending in March 2018, 15% of bread and bread product launches in the United States contained ancient grains. The most popular were millet, quinoa, and sorghum. Fermented foods have taken off in recent years. One survey even predicted that fermented foods would be the No. 1 “superfood” group of this year! This is driving increased interest in sourdough bread, which is made using a slow fermentation process. Evidence suggests that this makes foods both more nutritious and easier to digest. Not only that, but the fermentation process is credited with making it possible for some people with gluten intolerance to eat bread again. What this all boils down to is that people are paying more attention to what they eat. They’re reading nutrition labels, evaluating health claims, and making more conscious decisions about what they put in their bodies. This presents a huge and growing opportunity for the bread industry to reverse recent declines and set their sights on growth. Want to know what equipment you need to produce artisan bread at scale? Check out Equipment Overview: A Complete Production Line for Artisan Bread.